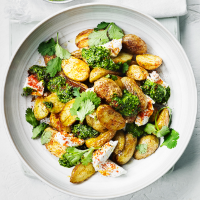 Here, the earthiness of the spuds underpins the great flavours of the coriander, smoked paprika and fresh goats’ cheese. 1. Boil the potatoes in salted, boiling water until soft enough for a sharp knife to slide easily into the centre (about 15-18 minutes). Drain well and, once cool enough to handle, halve lengthways. 2. Keep back a few coriander leaves, then in a small food processor, blend together the rest of the coriander leaves and stalks with the cumin, lemon juice, 1⁄2 the garlic and 2 tbsp water. Gradually whizz in 5 tbsp olive oil to make a smooth sauce. Season well – you’ll need at least 1⁄4 tsp salt – and leave to stand for 15 minutes. Taste and adjust the seasoning as necessary. the final minute and pile onto a serving plate, dotting with blobs of the cheese. Drizzle over the sauce, add a pinch more paprika and scatter with the reserved coriander leaves.